Never-before-seen images are shining new light on a grim chapter of Washington’s history, when the Ku Klux Klan operated from state headquarters in Belltown, its members gathering robed and hooded at what longtime Seattleites might remember as the Crystal Pool. The additions to a University of Washington Web site came about as part of a senior-level history class. The rare photos and newspaper clippings tell of the Klan’s broad presence in this region during the 1920s. There’s the Sedro-Woolley wedding of Klan members in full regalia, a night parade in Bellingham and rallies in places like Renton and Issaquah that at times drew crowds of up to 50,000. The KKK helped elect public officials across the state – including a mayor in Kent during the early 1920s – and published a Seattle-based newspaper called the Watcher on the Tower. “People in Washington state really have not known about the strength or impact of the KKK here during the 1920s,” said James Gregory, UW professor of history who heads the Web site, called the Seattle Civil Rights and Labor History Project. Finding few blacks at which to aim their venom in the pre-World War II Northwest, the white supremacists here focused instead on the Roman Catholic church and on foreigners. “Historians focus on the Klan as a powerful force in places like Oregon, in Midwest states and of course in the South. But the Klan had tens of thousands of members right here in Washington,” Gregory said. The Ku Klux Klan was founded in 1865 by veterans of the Confederate Army to restore white supremacy in the wake of the Civil War. With a record of intimidation and violence aimed at blacks, Jews, foreigners, Catholics and labor, the KKK was prosecuted under the Civil Rights Act of 1871. But it rose again, reaching a membership peak of 5 million in the mid-1920s when its reach spread far beyond the boundaries of the Deep South. Its inclusion on the Web site is part of ongoing research on civil rights and labor in the Pacific Northwest by faculty and students at the UW. Discovery of many of the photos and other documents came about as part of a fall 2006 history class called White Supremacy in Western Washington. “Much of this is information that is known to experts, but now the Internet is providing an opportunity for it to be made publicly available,” said history doctoral student Trevor Griffey, who led the class and did much of the research. “Flaming crosses and Klan robes are some of the most powerful and horrifying images that we identify with a history of racism in the United States,” Griffey said. And in places like the Northwest, where many believe the Klan was not a force, it can be hard to document the history of racism. As part of its resurgence, the KKK successfully organized in Oregon before coming to Washington around 1923. There is no evidence it was as violent here as it had been elsewhere. Klan leaders appealed to people’s Christianity, their patriotism and a fear of foreigners. Records show that, along with a Kent mayor, a city attorney in Bellingham was an open member of the Klan. In fact, in 1929, when the Klan held its state convention in Bellingham, its grand wizard was introduced by the mayor and given a key to the city. Many of the photos on the Web site were obtained from the Washington State Historical Society, which bought its collection from the estate of Tacoma photographer Marvin Boland, himself a Klan member. The Klan’s undoing at least in Seattle began around 1924, after it unsuccessfully backed an anti-private-school initiative in this state, aimed at Roman Catholic schools, similar to one it had pushed through in Oregon that was repealed. That plus internal scandals led to the beginning of the Klan’s demise. But it retained a presence here through the 1930s, its power base shifting from Seattle to Bellingham, said photo historian Jeff Jewell, with the Whatcom Museum of History & Art. Ku Klux Klan Gathering, Crystal Pool (2nd and Lenora) in Downtown Seattle, WA. March 23, 1923. This special section of the Seattle Civil Rights and Labor History Project documents the history of Washington State’s 1920s chapter of the most infamous white supremacist organization in American history, the Ku Klux Klan (KKK). The Washington State Klan during the 1920s was part of the second of three waves of KKK activity in America. The second KKK was founded in 1915 and gained significant membership immediately following World War I. Though short-lived, it was a powerful anti-immigrant, anti-Catholic, anti-radical, white supremacist organization that promoted “100 percent Americanism.” The second KKK claimed over 4 million members across the country; briefly dominated state legislatures of Colorado, Indiana, and Oregon; and in 1924 shaped presidential politics and helped pressure politicians to pass the most severe immigration restriction in the history of the United States. Following immigration restriction and a series of leadership scandals, the second KKK collapsed and was largely moribund by 1928. The second KKK was a mass movement that invoked the memory of and built upon the first KKK, which was a terrorist organization founded by white supremacists in the U.S. South. The first KKK’s violent “night riding”– in which hooded vigilantes used lynchings, whippings, and torture to intimidate recently freed slaves and their white allies — played a crucial role in the disenfranchisement of African Americans at the end of the Civil War in the 1860s and 1870s and laid a foundation for the rise of Jim Crow segregation in the 1890s and 1900s. The second KKK also helped train some of the leaders who later formed the third KKK, a mainly Southern organization that rose up in the decades after World War II to murder and terrorize people in African-American communities, particularly civil rights movement activists. Klan members’ hoods, white robes, and burning crosses made them icons of American white supremacy and terrorism, and their legacy haunts us to this day. The Washington State KKK during the 1920s was founded by organizers from Oregon, which had one of the strongest Klan chapters in the country at the time. 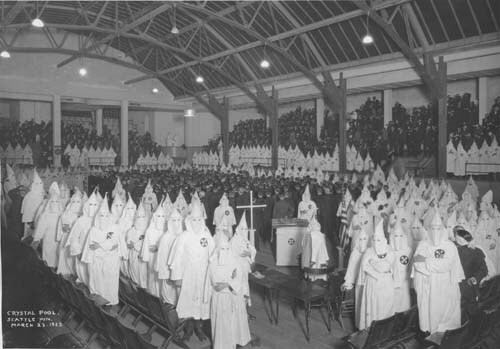 The State Klan organized a series of massive public rallies in 1923 and 1924 that ranged from 20,000 to 70,000 people. While they publicly disavowed violence, Klan members participated in violent intimidation campaigns against labor activists and Japanese farmers in Yakima Valley and probably elsewhere. They put forward a ballot initiative in 1924 to prohibit Catholic schools that voters soundly defeated. And though most of the State’s Klan chapters collapsed in rancor following the defeat of their anti-private school initiative, a strong presence persisted in Whatcom and Skagit Counties throughout the 1930s. In the 1930s, some prominent leaders in the region’s KKK went on to become involved in the facist Silver Legion, or “Silvershirts,” a national movement that, while small, was quite active in Washington State. And there is evidence that the Klan in Bellingham helped pioneer intimidation practices that paved the way for anti-communist witch-hunts in the 1940s. This special section on the KKK was created by Trevor Griffey and includes three historical essays courtesy of Trevor Griffey, Brianne Cooke, and Kristin Dimick. It presents dozens of rare photographs, newspaper articles, and documents thanks to gracious contributions from the Washington State Archives, the Washington State Historical Society,the Whatcom County Historical Society, and the Skagit River Journal. The Face of Hate is still alive and well in America.